Porchlight Family Media has released their second stand-alone audio drama production. Like the first release, this audio drama is also a biblical story told with a little twist. 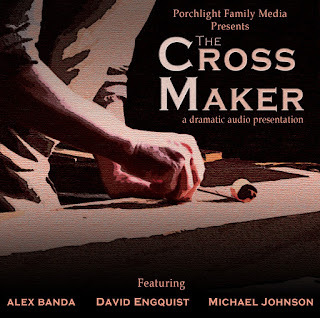 The Cross Maker is a dramatization of the story of the crucifixion of Jesus, but it is told from the perspective of the carpenter who built the cross. In 1st-century Jerusalem, it is a time of unrest and oppression by the might of the Roman Empire. The Cross Maker is the story of a man whose dream was shattered by the strictures of a hated government. It is the story of a life that was forever changed--first by cruelty and hatred, then by the love and forgiveness of Jesus Christ. This audio dramatization chronicles the journey of the carpenter who crafted the instrument that brought death to one, and life to millions. It is available to listen to for free on the PFM website where you can also download a high-quality MP3 copy for free. CDs are also available for purchase. The CDs include exclusive, bonus material not available anywhere else. Check out The Cross Maker here. Disclosure: Audio Theatre Central is a part of the Porchlight Family Media network.